It can sometimes be confusing to find the ideal cremation urn for your deceased because they are available in a wide variety of shapes, sizes, hues and themes. In order to best honor the life of your departed after he or she has been cremated, it is important to gain insight into the different types of urns. Some of the popular kinds of cremation urns are keepsake, biodegradable, companion, infant, veteran, picture, religious, theme and art. Keepsake urns come in smaller sizes and are usually used by people who live far apart and want to share the cremated remains of a loved one. This allows surviving family members and close friends to share in a memorial of the deceased. Keepsake urns are also utilized when a family scatters the ashes of the departed and wish to keep a small portion of the cremains. This type of urn can be found in many different shapes, styles and materials. Biodegradable urns are made from ecologically-sound and non-toxic substances and are among the most frequently used urns in recent times. Examples of materials used to make biodegradable urns are mulberry bark, organic compost, newsprint, cornstarch, salt blocks, paper clay, earthenware clay and unglazed ceramic. These urns are handcrafted and fully break down in the environment over time without any harmful effects. This type of urn can be used for interment and for scattering. Companion urns are specially made to store the cremated remains of two people. A companion urn is a good way to memorialize the lives of a couple, keeping them together even after death. These urns are sold in two different model types- they come with either single or double compartments. In the sad situation of having to make cremation arrangements for a child, there are infant urns available for use. This urn type is usually smaller and crafted into a theme related to children. Most of these kinds of urns can be customized to accommodate the wishes of the grieving parents. A veteran urn pays tribute to the selfless service of a loved one who was a member of the Armed Forces. All of the urns in this category reflect a patriotic spirit. They are available in a range of materials and can be personalized to identify the branch of the military in which the deceased participated in. A picture or photograph urn is the ideal way to display a treasured photograph of the departed. Looking quite like a photo frame, a picture urn has a hidden chamber to store the ashes of the deceased. The photograph of the loved one is seen on the face of the urn, and can be either laser etched onto the urn itself or placed in the frame. A religious urn helps to represent the faith of the departed individual. The design theme of such urns draws upon the spiritual world. Many different religious beliefs and aspects of spirituality can be easily illustrated by using the appropriate religious urn. A theme urn is often used by family members when they want to showcase a specific hobby, sport or interest of the loved one. Urns can be themed to highlight such pastimes as fishing, painting, sailing, motorcycle riding and music. Theme urns are a perfect way to capture the individuality and personality of the deceased. 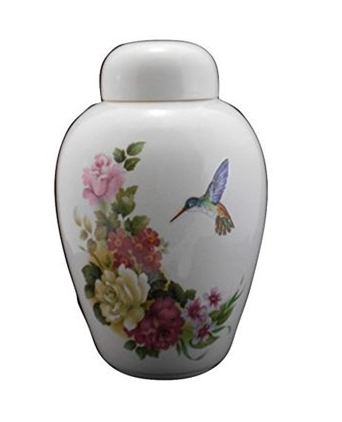 An art urn combines works of fine art with a secret compartment where cremains are placed. Art urns are often tailormade to be most fitting to the loved one. They are handmade by talented artisans in materials such as glass, bronze or ceramics. To better determine the size of the urn that suits your needs, you will need to know an approximation of the body weight of the departed. A pound of physical remains produces a little under one cubic inch of ash. For example, cremating a 100 pound person will result in about 100 cubic inches of cremated remains.